. . . . . Who travelled in and out my door, I'm glad they came along. (song by Willie Nelson) . . . . .
She was the girl of my dreams. Barefoot, wearing a flower in her hair, she sat by me in Differential Equations class. We sat on the back row, she was writing an essay for English 317 while I was busy taking notes and trying to understand. I got my "C", she made a big "A". Leaving her yellow dog at the building steps, my friend with straggly blonde hair complained to me of the campus police feeding the dogs. Our walks were full of them, sleeping and waiting for their straggly haired lady friends to get out of class. She rode an old bike, pedaled herself all over the town. I drove my seven-year-old '62 Volkswagen, one with a cloth top that rolled back for letting the sunlight in. On rainy days I might give my girl friend a ride. I remember the day I locked my keys in the VW while it was still running. That embarrassed me. We built a sidewalk where before the children had none. They walked to school in the mud. Saturday mornings this was the thing we did. It was a ride of sixty-miles to the north edge of town. We talked of the things we liked, the things we did before, and what we wanted to do. We'd stop on the way home to get food for her cats and a bone for the dog. Had a sundae for the road. Then one afternoon after lunch, the day came we didn't go back to work. We must have talked the afternoon away. I felt she wanted to do other but my honesty said no. Her husband was in the Army and wasn't due home for another six months. But I'd been there, done that unawares, it isn't fair. One day she, I won't say who, came to my apartment and we went for a motorcycle ride. Enough said about that, her hubby was in the service too. I played it honest, straight, and narrow. I dare say these last two were inviting for more and I still have some regrets. On sunny Sunday afternoons I'd ride my motorcycle around in the parks. Seemed there was a band playing under every tree. I tell myself that the ZZ Top (link) played there also with the oodles of others. The Beatles were slowing, the hippy girls were outgrowing. I couldn't pick out my friend there, there were so many. In the parks, on the streets, and on Saturday nights swarming over the loading docks on Prairie Street. A nice coworker girl she, we had a date. She was of the hippy variety, we both dressed better for work. At a Rice versus Houston football game, WE lost my car at Rice Stadium. So we waited until the crowd left and then the car was still there, NOW waiting for us. This is a true account, with a twinge of historical fiction. - - Poem Copyright © 2014 Jimmiehov. 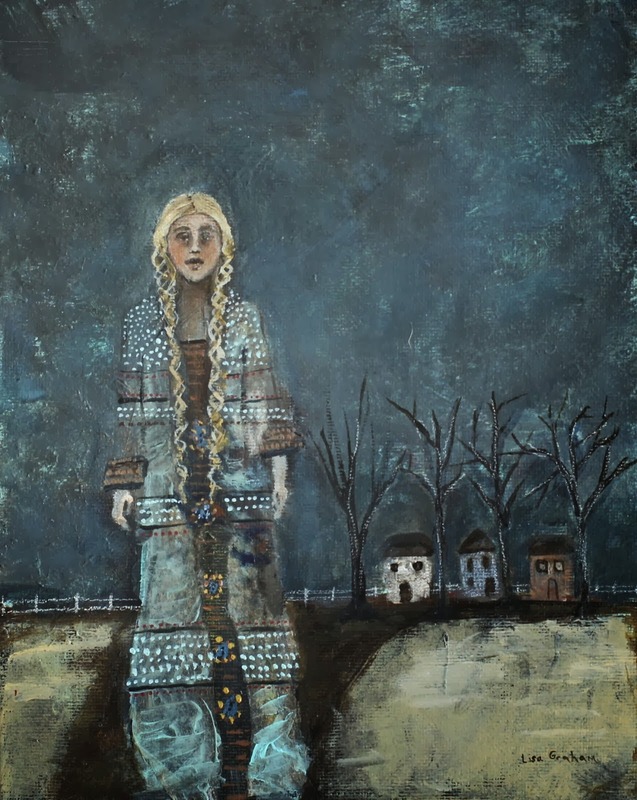 All Rights Reserved Today I'm linked with the Real Toads, Sunday Feature featuring Lisa Graham. posted by Jim @ 3/28/2016 11:18:00 PM now 3 comments from readers. . Please post your comments. Thanks. posted by Jim @ 1/17/2009 07:10:00 AM now 0 comments from readers. . Please post your comments. Thanks. posted by Jim @ 1/17/2009 06:40:00 AM now 5 comments from readers. . Please post your comments. Thanks. That is from 2 Timothy 4:7 (link), Mema died January 16, 2007. She would have been 90 years old on February 19, 2007. 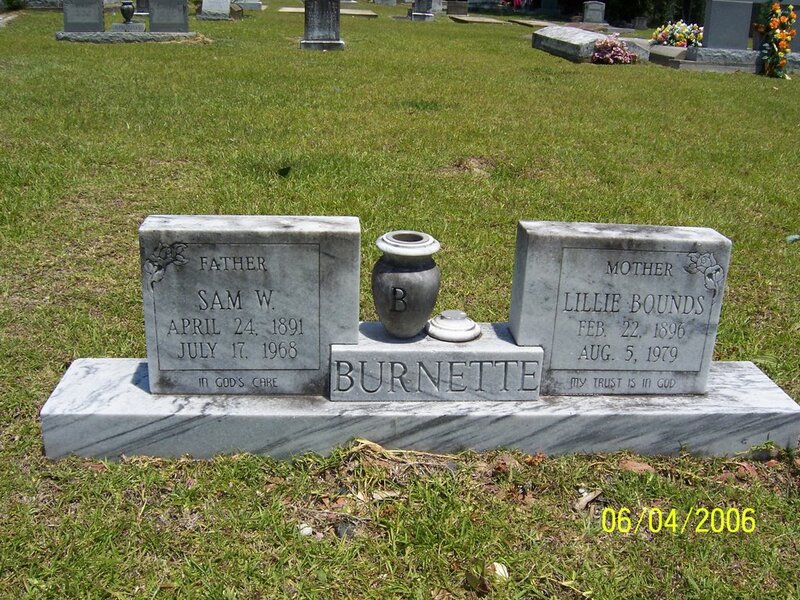 She was buried Saturday, January 20, 2007, in the New Hope Baptist Church Cemetery (link) in Hineston, Louisiana. Her final resting place will be there with her family. 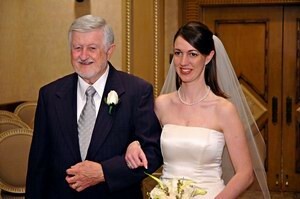 Her migration story, coming to Louisiana from Mississippi is on the February 19, 2006, blog (link). She had some more stories, Mrs. Jim and I will compile and post them soon. posted by Jim @ 2/13/2007 02:24:00 PM now 5 comments from readers. . Please post your comments. Thanks. 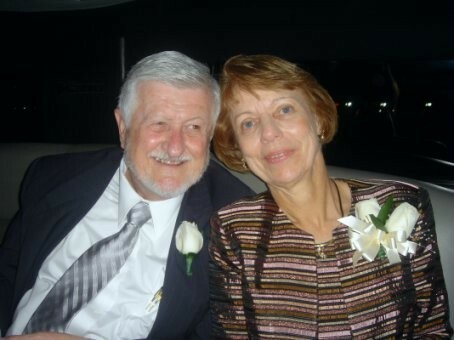 Services:1:00 p.m., Saturday, January 20, 2007 in Bolton Chapel at Emmanuel Baptist Church, Alexandria. Visitation:4:00 p.m. until 8:00 p.m., Friday, January 19, 2007 at Hixson Brothers, Alexandria. 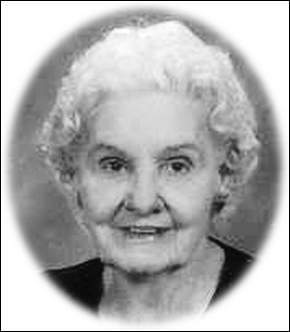 Services for Viola B. Tassin will be held at 1:00 p.m., Saturday, January 20, 2007 in the Bolton Chapel of Emmanuel Baptist Church with Dr. Lee Weems officiating. Burial will be in New Hope Cemetery, under the direction of Hixson Brothers, Alexandria. Pallbearers will be J. B. Shelley, Brian Dyer, Phillip Dyer, Justin Shelley, John Premeaux, and Nippy Blair.Mrs. 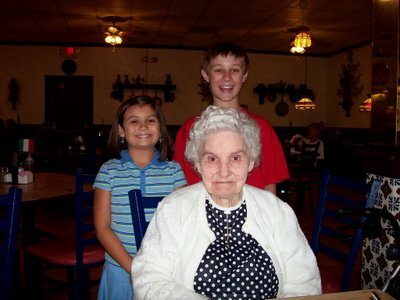 Tassin, 89, of Alexandria died Tuesday, January 16, 2007 in Park Manor Skill Nursing, Conroe, Texas. She was a member of Emmanuel Baptist Church where she worked in the nursery for 62 years. During her working career she was a private sitter. Mrs. Tassin was a kind, giving person and a woman of unwavering faith. Preceded in death by her husbands, Eugene N. Pitre, Sr. and Louis J. Tassin; parents, Sam and Lillie Bounds Burnett; brothers, George Burnett, Marvin Burnett, Leroy Burnett; sisters, Vera B. Tucker, Lillie Mae Foret, Marvilee Terrell. 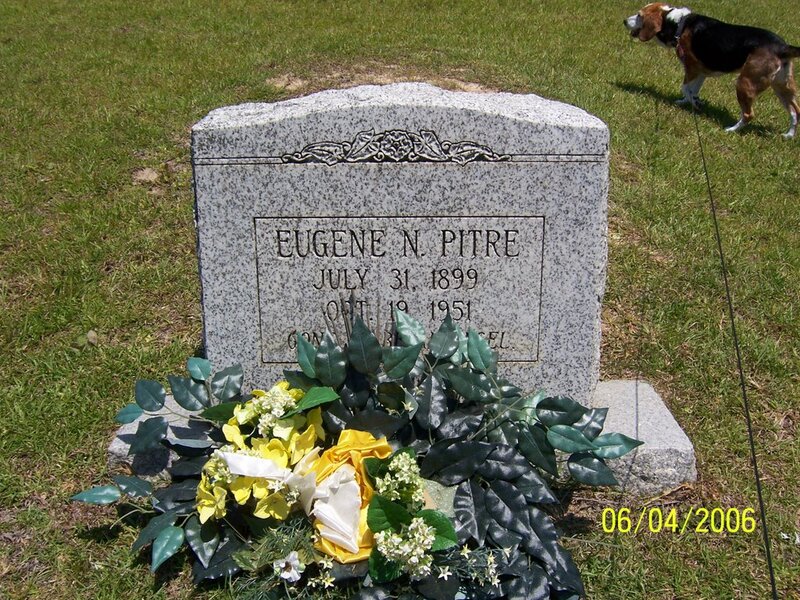 Those left to cherish her memory include her son, Danny L. Tassin and wife, Winetta of Milan, Tennessee; daughters, Velma P. Dyer and her husband, Royce of Farmerville, LA; Arlene P. Hovendick and her husband, James of Montgomery, Texas; brother, Lonnie Burnett of Glenmora, LA; ten grandchildren and eight great grandchildren; numerous nieces and nephews. Friends may call Friday at Hixson Brothers, Alexandria from 4:00 p.m. until 8:00 p.m. and Saturday at Emmanuel Baptist Church from 12:00 p.m. until service time. 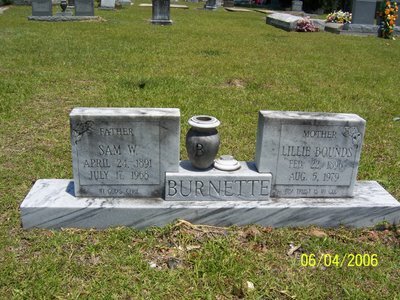 Memorials may be made to Emmanuel Baptist Church Preschool Nursery Fund, 430 Jackson Street, Alexandria, LA 71301. From on-line obituary, click here for Hixson Bothers. posted by Jim @ 2/13/2007 02:22:00 PM now 0 comments from readers. . Please post your comments. Thanks. Mema always said all her great-grandchildren were great. I'm sure these two had learned this verse. Mema generally would tell you this tale. One time a little boy and girl in her nursery were fighting. Mema told them to remember Ephesians 4:32. One replied, "We didn't forget it, we just aren't doing it." Mema then said, "and further more, God doesn't live in places where people fight." One child then came back, "Why doesn't God come live with us, it's a lot better than this [meaning the nursery]?" Did Mema meet her match that time? Of course not, those kids knew and were reminded of their improper behavior. There are two parts of following God's wishes: first one must know what God wants, the Bible tells us; then we must obey, 'just do it' as the Nike slogan says. Ephesians 4:32 and Mema's 62 years of working were a focal point during the minister's message at her funeral yesterday. posted by Jim @ 2/13/2007 02:20:00 PM now 2 comments from readers. . Please post your comments. Thanks. Mema's first cousins are all in their 80s. One drives her Ford pickup (rather fast on those back Louisiana roads, I must say) everywhere. From left to right is Viola (Mema, Mrs. Jim's mother), Gracie (a cousin by marriage), Louvenia, Oma, and Ethel. All of them were born and grew up in Central Louisiana. 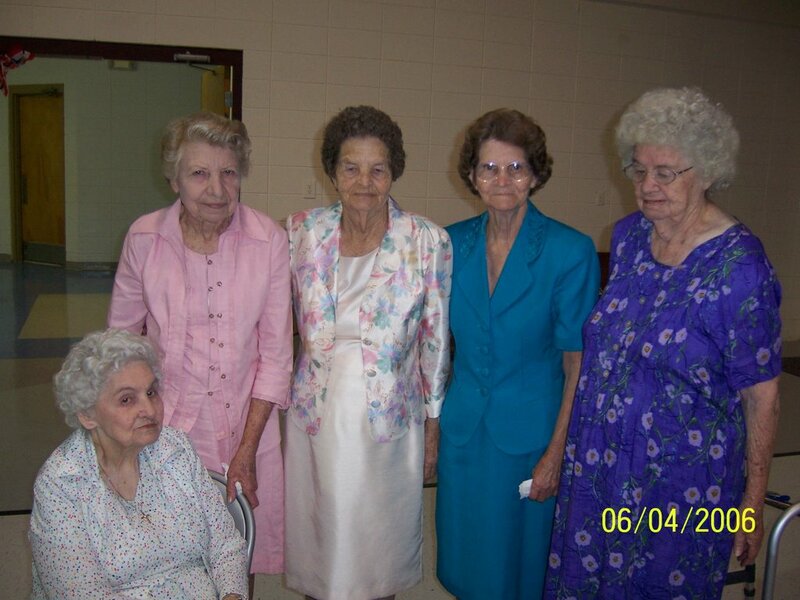 They all still live there, except for Mema, who lives in Texas near us. All are widowed. 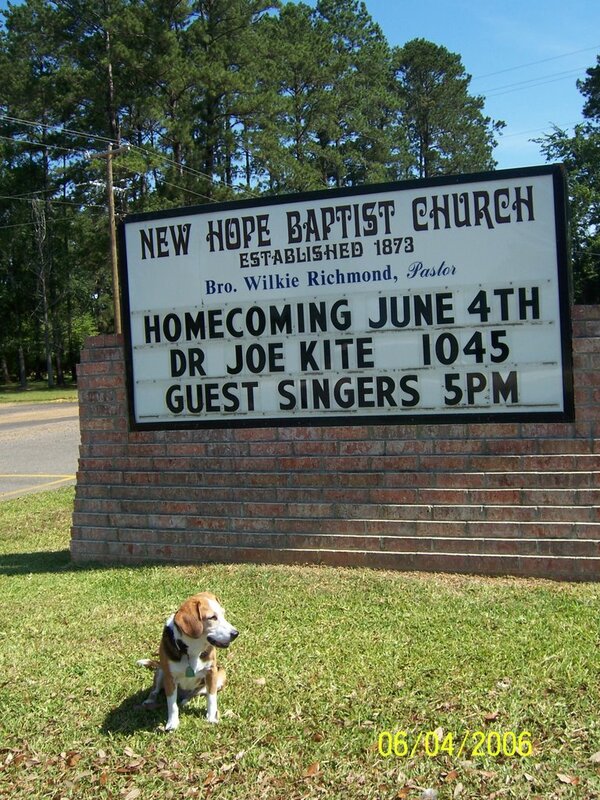 We met at the New Hope Baptist Church in Elmer, Louisiana, for Homecoming 2006. Only Mema had been able to come to the family reunion the week before in North Louisiana, so this was a second reunion for them. Mema, Mrs. Jim, Adi, and I drove over to Alexandria, Louisiana, Saturday morning. That is about a five hour drive. On the way we ate at the Boiling Pot in Sulfur [not Sulfer ], La. Things just weren't as good there as when we were there before. In fact, our food wasn't very warm at all. We visited Mema's brother, Lonnie, on the way up. Mema and Lonnie are the only survivors of the eight children. We had a nice get-to-gether with him. Lonnie's health did not permit him to attend the reunion the week before. Mema gave him her doggie bag chicken and sausage gumbo left over from the boiling pot. It was a lot better hot, Mrs. Jim tasted it. After our nice visit with Lonnie we proceeded to Mema's home in Alexandria. On the way we stopped at the Woodman of the World camp to check it out a little for next year's reunion. Mrs. Jim didn't sign any contracts for it. Mema's home was doing fine, one neighbor was parking his van in the driveway and another was mowing her yard. The lady across the street came over and we had a nice visit with her. She has fine neighbors. We spent the night at the new Comfort Inn on West Bolton. It was really nice. 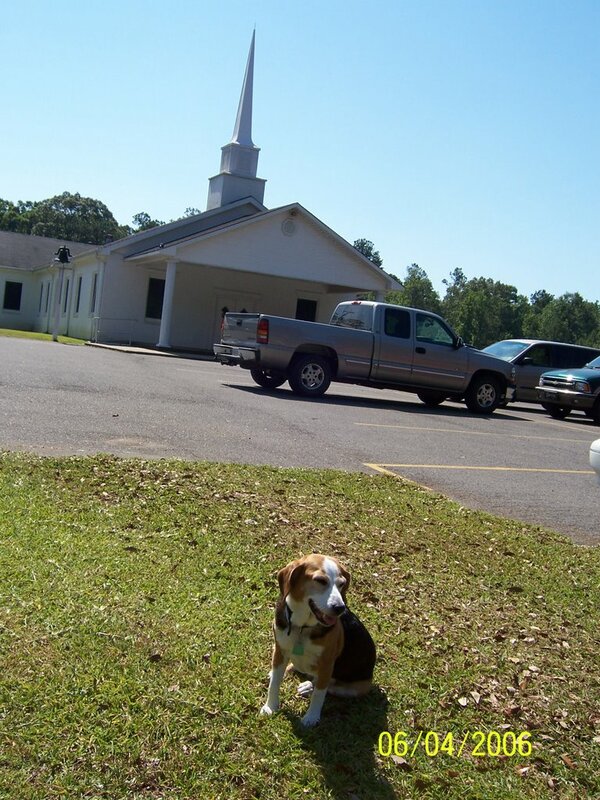 We ate the included continental breakfast and went to Emanuel Baptist church. I got my coffee and headed to a men's Sunday school class. Then I heard Mema fussing in the hall. She said we would be late for the Homecoming at new hope if we stayed. We couldn't convince her it was only a half hour drive. So we left. Of course we got there a good hour before the church service (Homecoming service this time). 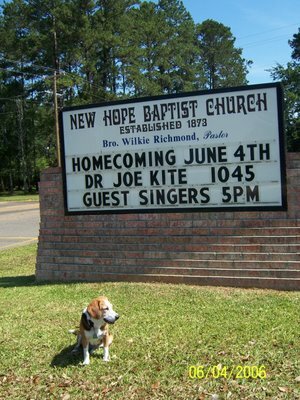 The service was good, the guest minister, Dr. Joe Kite, gave a fiery sermon. He is about a year older than me, both of us slightly younger than Methuselah. He had a keen sense of humor. Since he didn't know us, he looked our way a lot; sure he didn't want to miss an opportunity for a convert. The piano player played like church music should be played in a Louisiana country church. Her grandmother was a cousin of some sorts to the five cousins. They took up three offerings, the first was for cemetery maintence. That's part of what Homecoming is for, to raise money for the cemetery maintenance fund. Both Mema and Mrs. Jim contributed. The next offering was taken by the children. Most everyone's pocket change ended up in a bucket, earmarked for a mission project. I don't think there was much money left then for the regular offering, but they had it too. Following the service there was a pot luck dinner. Everything from beans to potato salad, mashed (cooked first) carrots to deviled eggs, and King Ranch chicken to barbecued brisket. None of the chocolate pie Mrs. Jim brought was left. When we finished eating a lot of us went over to the cemetery. All of the cousins went along with some of their kids, grandchildren, and great grandchildren. We drove over to where Mema's parents were buried. Mema was getting worn out, so she didn't get out of the car. After visiting the graves we went to Gracies home. Gracie, Ethel and all of us visited for a couple of hours. Our trip home was uneventful. We didn't need the St. Christopher statue we haven't bought yet. No blowouts or anything. Mrs. Jim and I trade off driving, she drives mostly when I get sleepy. Our car enjoyed that $2.7x gasoline (premium). We missed the final fillup so had to do that for $3.01 in Conroe, Texas. And the ladies really enjoyed their day, even though it wasn't a planned reunion. posted by Jim @ 2/13/2007 02:16:00 PM now 0 comments from readers. . Please post your comments. Thanks. Mom liked those Nebraska Corn Huskers! 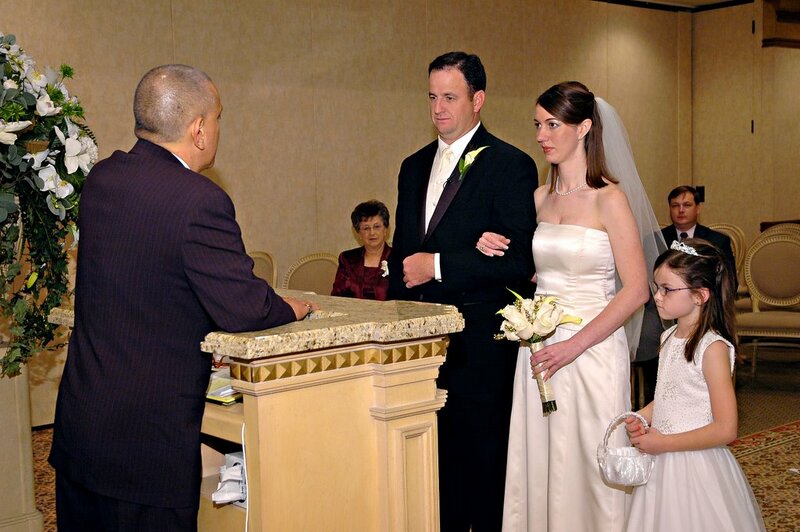 originally posted Saturday, September 16, 2006, in me, old blogs never read, and . . . Mom was a BIG Husker fan. A really big one. As far as I know she had only been to one game, at the one that LSU tied Nebraska at LSU with us . Mrs. Jim has two degrees from LSU so we all had a good time. In the 90s some time, Mrs. Jim and I got my mom a hand-painted plywood Harry Husker like you see all over Tekamah during football season. The craft place just south of the hardware store was selling them. Mom watched every Nebraska football game that was on TV. If it wasn't televised then her radio was ready for the game. She would worry every minute of play (don't we all) about her Huskers and wished them along for the entire 60 minutes of playing time. She would put her Harry out in the yard every game day. The rest of the time Harry lived on her front porch. When Mom died Harry became mine. He lives in our office room and sometimes gets to come out for football games. Harry did get us a ticket. Well, not a real ticket, but a letter from the Properties Owner's Association telling us we were in violation for having an unauthorzed sign in our garage window. We have more Oklahoma State people in our subdivision than Husker fans. I think one of these other team fans turned us in. That time he had been in the window for a couple of weeks. He is in our dining room window as of this morning and will stay at least until January something. I missed out somehow on Herbie. Maybe I was behind the door when he was announced. For sure I was in Texas. I have heard people calling our Harry by the wrong name and until today I just figured he was going by another name. But I googled 'Harry Husker' and found out these guys were different in time. Besides Bob's below, another site with pretty good info is on the Husker News at the Husker Press Site. Read it for a better rundown about Harry's demise. They did a cute interview today with Harry. Harry was quoted as willing to return to Lincoln to help the team. The guys here are from the Web site of Bob's Gridiron Grille and the Pigskin Pub, [1-17-2009 update: that link is broken, try this] located at 4200 South 27th Street, Bishop Heights Shopping Center, Lincoln, Nebraska. At 27th and Hwy 2. The information about the mascots is also courtesey of them. SEE NOTE BELOW!! Harry Husker--"The 1960's Harry HuskerWhen Bob Devaney arrived in Nebraska in 1962, he felt Nebraska needed a new image and a new mascot. He finally found that mascot in 1964 when he was reading an article in the NEBRASKA FARMER MAGAZINE. 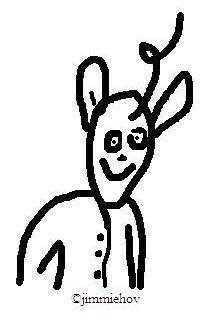 Inside was a mascot drawn by Bill Goggins, the magazine's art director. Nebraska asked for permission to use the mascot and in 1965, Harry Husker was adopted as the official Nebraska mascot." Herbie Husker--"The 1970's Herbie Husker When Tom Osborne took over the head coaching duties in 1973, it was felt that a new mascot was needed for the new era of Nebraska football. At the end of Coach Osborne's 1st year, the team traveled to the Cotton Bowl to play the University of Texas. While at the Cotton Bowl, the Lubbock, Texas artist Dirk West had created a caricature to hang in the Cotton Bowl headquarters. 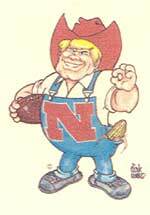 Nebraska officials saw the caricature and commissioned Dirk West to perfect the mascot. In 1974, the revised mascot was officially adopted as Nebraska's new mascot." [Herbie courtesy of Capital One All Mascot Team ]. Lil' Red--"As the Osborne Era was starting to wind down, after 25 glorious years, it was felt that Nebraska needed a new image. 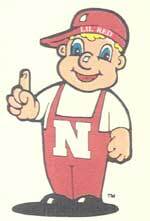 Although Herbie Husker remained as an official mascot, a new mascot was adopted in the early 1990's. At present, Nebraska has two mascots, a new looking Herbie Husker, and Lil' Red." Closed before I even knew it was there! We will miss our valued employees and faithful customers! Thanks for all the good times! Our trouble started with the City of Lincoln's smoking ban, and ended with a serious disagreement with the landlord. We like our Harry and will just keep him for all our time. p.s. You can see him also on my September 15 post (link) as well as links to the Husker fight songs, etc. posted by Jim @ 2/06/2007 04:06:00 PM now 0 comments from readers. . Please post your comments. Thanks. posted by Jim @ 7/23/2006 12:06:00 AM now 2 comments from readers. . Please post your comments. Thanks. They have been married for one year this day. And we wish them to live happily ever after. It was a year ago in Las Vegas with family and friends. 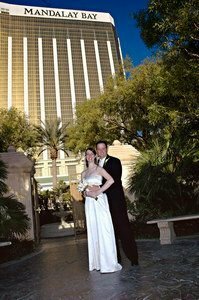 The wedding was in the Wedding Chapel of the Mandalay Bay Hotel, where we were all staying. 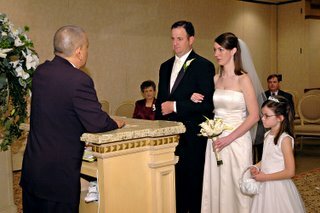 I really didn't want to go sit down after I had presented the bride. 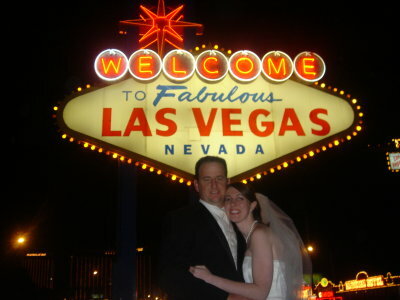 It was a beautiful wedding and we won't forget that day! posted by Jim @ 6/29/2006 10:43:00 PM now 1 comments from readers. . Please post your comments. Thanks. Grandchildren are the Joys of our Lives. Sometimes they come as babies and sometimes they come as a 7 year old. Either way they are wonderful and GC#4 is especially wonderful. She is enthusiastic and inquisitive. She likes adventures with grandparents and that really pleases us. Things are never dull when GC#4 is around. She is tireless or at least us old folks have never been able to "wear her out". 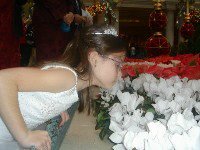 She gives us the opportunity to do the things again that our older grandchildren have outgrown such as the zoo, with their night opening with Christmas lights. That was fun as were the lighted paddleboats we got to ride in. 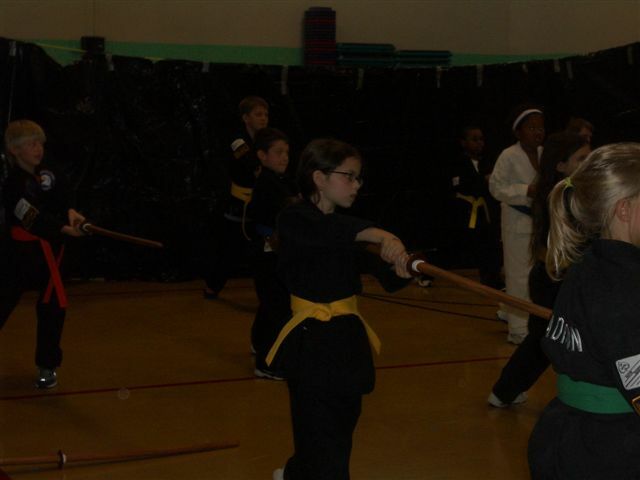 This is a picture of our newest grandchild taken in her karate class. 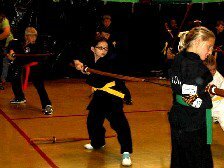 Notice she is wearing her yellow belt. We haven’t seen her yet wearing her suit and yellow belt. 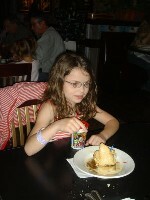 She is now eight and is in the third grade. We love her very much and like to visit with her as much as we can. 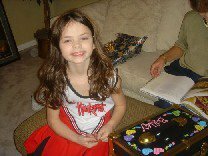 On December 20, 2005, this precocious little girl officially became a member of our family. 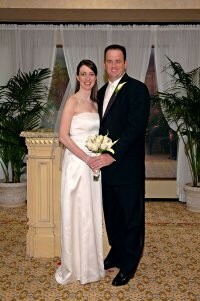 Our daughter, Karen was married to our now son-in-law, Billy. Along with Billy came GC#4, his then seven year-old daughter. We are so glad. PapaJay asked GC#4 a few questions and here are her responses. When she grows up she wants to be an author of children’s books. For sure GC#4 takes time to smell the flowers! posted by Jim @ 4/28/2006 03:32:00 PM now 2 comments from readers. . Please post your comments. Thanks.